A R Murugadoss is joining hands with Suriya once again in the Tamil film 7Aum Arivu, which is one of the big reasons for the film to become a big hit this Diwali. Their preivous outing Ghajini created history in Tamil cinema. The electrifying Suriya-Asin chemistry, record-breaking songs by Harris Jayaraj and sleek direction by Murugadoss were a huge success. The film made so much news that Aamir Khan remade the film and it went out be one of the biggest blockbusters of 2008 in Bollywood, making Murugadoss a star director. Suriya's looks in the film have created a lot of buzz. One of the roles played by Suriya is that of Bodhidharma, a monk from Kancheepuram who is worshipped in China for his martial arts skills. He was said to be a Pallava prince who had renounced life, travelled to China and established Zen Buddhism. He also founded the martial art of Kung-fu. He is deified in several parts of the world. It is said that every Buddhist temple in China has a shrine to Bodhidharma to the left of the sanctum sanctorum of Gautama Buddha. 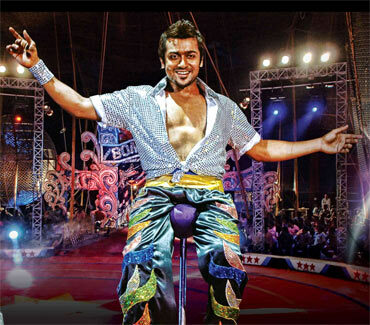 Suriya is also acting as a circus artiste in the film, and it was reported that he learnt many tricks to play the role. This is also Kamal Haasan's daughter Shruti Haasan's debut film in Tamil. She plays a young scientist. Murugadoss had admitted that he chose Shruti because she looks intelligent and beautiful. Then, of course, Ravi K Chandran's cinematography and Harris Jayaraj's music make the film really hot this Diwali.